There is a lot more than can be said about the importance of the Omega-3 / Omega-6 ratio in our diet. There are entire chapters in many resources that are devoted to the importance of Omega-3s. I’ll return to Omega-3s in future blogs. For now, let’s turn our attention to something we are all very familiar with: fiber. 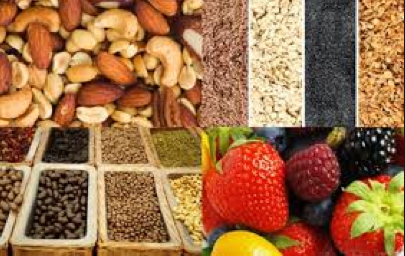 The foods that are high in fibre are too numerous to list and include delectable tastes to please your palette. Fiber is such an important aspect of our diet that many people are aware of fiber’s role in our digestive system. We are all familiar with how oats, and all of its variations, provide a hefty dose of fiber. What many might not be aware of is that flaxseed has more soluble and insoluble fiber than even oats! Insoluble fiber is what we are referring to most of the time when we speak about fiber being good for the digestive system. We cannot digest insoluble fiber. Its role is to move things along in the intestinal tract. This process bulks up the stool and helps to prevent constipation. Soluble fiber lowers blood cholesterol levels, and regulates the blood glucose and insulin levels. This means that foods high in soluble fiber are great for people with diabetes or who want to help reduce their risk of heart attacks. Soluble fiber also acts as an intestinal stabilizer. This stabilizing effect can help those individuals suffering from some degree of Irritable Bowel Syndrome (IBS). High fiber diets can also help to prevent diverticulosis and diverticulitis. And, if that isn’t enough, high fiber diets can lower the risk of colon and rectal cancers. For those of us that don’t have to deal with the threat of chronic diseases, a fiber-rich meal benefits our attempts at weight loss and weight maintenance. Fiber is processed more slowly through the digestive tract, promoting a feeling of fullness with less calories. This informative cookbook provides 101 facts about flaxseed along with 85 recipes covering everything from appetizers to desserts. Each recipe includes the nutritional analysis and notes the Weight Watchers Winning Points per serving. Elaine Magee, in her cookbook, The Flax Cookbook, cites a number of studies to back up these claims. One study conducted by Stephen Cunnane, Ph.D., a researcher at the University of Toronto, consisted of a group of women adding two tablespoons of ground flaxseed to their daily diets. After four weeks, their total cholesterol fell by 9% and the LDL (the “bad” cholesterol) dropped by 18%. Their HDL (the “good” cholesterol) remained the same. Studies have shown that eating fiber-rich foods is related to lowering risks of colon and rectal cancer, while other studies have even found a relationship between breast cancer risk and fiber. The good news about all this information is how simple it is to substantially increase your fiber. Two tablespoons of flaxseed gives you 4.6 grams of total fiber, with approximately 1.5 grams being soluble while the rest of the fiber in flaxseed is insoluble. This is twice as much fiber as what we get from the same amount of oat bran or wheat germ! This is also within the requirements of the FDA (the USA’s Federal Drug Administration) for reducing the risk of heart disease. See under “Resources” above for information of the origin of this photo. “Good” bacteria are essential. Not only do they make sure your digestive system works well, they eliminate the “bad” bacteria that produces gas. Undigested food builds up when you don’t have enough “good” bacteria and enzymes to quickly digest your food. The “bad” bacteria gives off carbon dioxide, methane gas, and hydrogen while eating the lumps of undigested food. 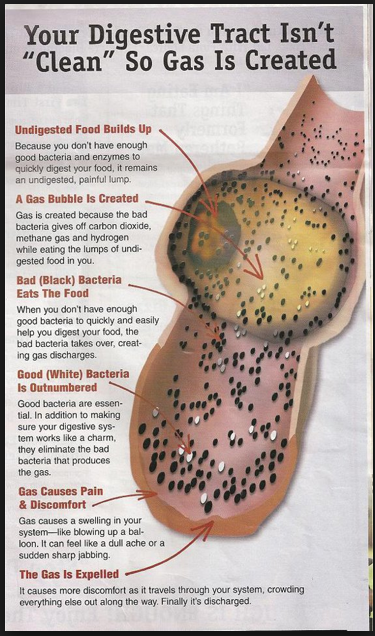 When the “bad” bacteria outnumbers the “good” bacteria in your digestive tract, the “bad” bacteria takes over, creating gas discharges. Gas causes a swelling in your system, like blowing up a balloon. It causes even more discomfort as it travels through your digestive tract, crowding everything else out along the way until it is discharged. 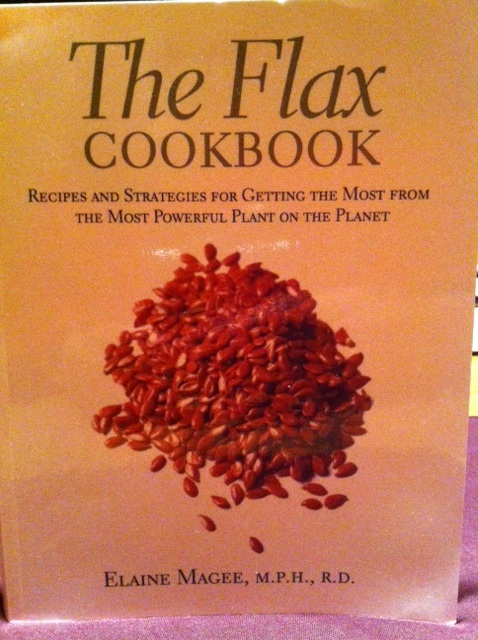 365 WAYS to use flaxseed: #4 – Gas No More! The following recipe was given to me by one of my flaxseed customers. She used it for over two weeks and reported that she no longer has flatulence problems! Boil 1 tablespoon of whole Canadian Goldenflax Seed© in 1 litre of water. Strain the flaxseed out of the water. Drink three times per day. BlendKit 2015 - What is Blended Learning?